And so we approach the end of another year, a year in which Machin definitives and Post and Go Faststamps have made the most GB philatelic news despite the efforts of Royal Mail's special stamp programme to engender some life into other areas of collecting, and to attract new collectors. 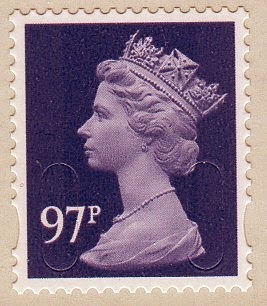 As written in the latest Stamp Magazine, the lack of mainstream media coverage of, for example, the Prime Ministers issue (which included Margaret Thatcher, surely one of the most controversial of modern PMs) demonstrated that the nationals didn't really take any notice of Royal Mail's output. But are we finished with this year's Machins and, aside from the Alice in Wonderland booklet stamp, what will be the first new Machin Security Stamp to appear next year? 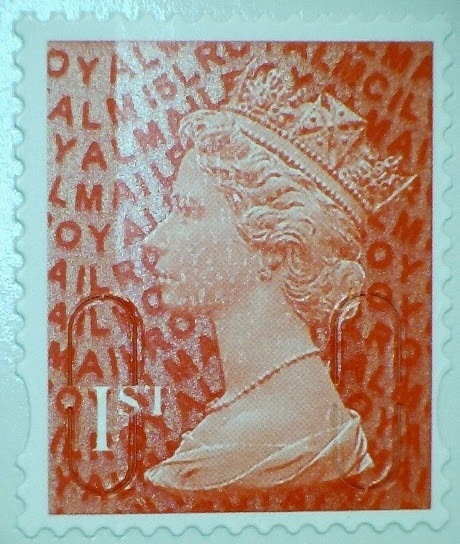 The only low-value stamp still to appear with a 2014 reprint date is the 1p, a value used so much to supplement the others that it must surely have been reprinted alongside the other low values and will appear quite soon. But my bet for the first sheet stamp to appear with a 2015 code is the 97p. Reprinted 6 times since the first (January 2014) printing this is possibly the most-used value outside the 2nd and 1st class NVIs. Post Office branches reported stocks running low in the Christmas period as, quite inexplicably, the value was not included in the Christmas set. There's no 97p in the Alice in Wonderland set either, which does - bizarrely - have two 81p surface mail stamps. We can expect the rate to change in the March/April review (probably to £1 which will save having a new stamp), but I doubt that there will be any 97p special stamps before then. The last set before the rate change is always a set of 1st class stamps - they have to be printed so far in advance of a decision being made on new postage rates that stamps with a face value are never included in the set issued in March. 4010P.4a - 10p MPIL from Great War PSB - shade and phosphor difference. 4020P.4a - 20p MPIL from Great War PSB - shade and phosphor difference. 4100P.4a - £1 MPIL from Great War PSB - shade and phosphor difference. I thought the date code reflected the printing date, not the issue date. If so, has this changed for the Alice in Wonderland booklet first class Machin which apparently will have M15L – surely not printed in the first few days of January?! Royal Mail's specification changes with the wind. At one time it was the date of issue, then the date they thought they would be issued (hence some appearing in the year before their date. Then it was the date of the contract, which meant that some 2013 ran over into 2014, and now it seems to be back to the date of issue. Alice booklets are coded M15L. Are the Alice in Wonderland stamps the first to have the security overlay on them? Or have Royal Mail knocked that idea on the Head. There was no official announcement to the trade about this, so we will just have to wait and see. I don't think there is any intention to put the iridescent overlay on special stamps. There's also the 50p which has not been reprinted yet, though I would expect we are unlikely to see a reprint of that one. Also, I suspect that cost may have been a consideration in the choice of M15L for the Alice in Wonderland Machin. I believe that Walsall printed this with their new Cerutti printer. As I understand it, this uses larger cylinders. It was probably not worth preparing a new M14L cylinder so late in the year for stamps that were not going to be issued until 2015 anyway. Yes, you're right. When HM The Queen visited the new plant at the i54 Business Complex off the M54 BBC TV showed the Alice booklet being printed, way ahead of any public release. Outside the printers I suspect only Royal Mail Stamps people, and dealers who had been at the trade briefing would recognise it for what it was! RE: "despite the efforts of Royal Mail ... to engender ... life"; Perhaps 'awareness' would be better if any of the post I receive actually had a special stamp on it! Given the values now printed on stamps, it seems one can only usefully collect GB stamps from mailed envelopes etc by living abroad! (or buying extra and posting them to yourself) Given the artistry that goes into each stamp, it's such a shame that Royal Mail can't do more to encourage use of their own product, even on things they send out themselves. An occasional FDC has arrived under cover of a stamp, but too many Business Frank Marks neutralise the existence of actual stamps. Merry Christmas, Happy New Year and keep up the good work - your website and blog are now my definitive source for information and news.